Levels of Discovery ROYAL ROCKER "PRINCESS"
Levels of Discovery HER MAJESTY'S THRONE "PRINCESS"
Levels of Discovery HIS MAJESTY'S THRONE "PRINCE"
DEERFIELD, Ill. - Looking to create innovating, unique and fun kids furnishings, a former president of Enesco has created Levels of Discovery, a company carving out a niche with a line of kids rocking chairs. Jeff Hutsell's first product launch is a line of pint-sized rocking chairs dubbed Rock A Buddies that encompass playful themes and offers hidden features, like a surprise music box, picture frame or a time-out timer. The chairs, available in 15 different designs and two sizes, also sport an understamp beneath the seat to add the child's name, the giver's name and the date of the gift. Priced to retail at $99.95 for the larger version and $49.95 for the smaller ones, the chairs ship ready-to-assemble with easy-to-follow instructions. Imported from China, the chairs are made of a combination of particleboard and rubberwood and are all hand-painted. Themes include a red, white and blue Americana motif dubbed Rockin' in the U.S.A.; the Royal Rocker princess chair; Barn to Rock with a barnyard theme and a music box that plays "Old MacDonald;" and time out chairs for boys and girls. "I like products that create one thing after another before the buyer discovers the price," Hutsell said. "That should be the last thing you get to, and at that point, it shouldn't be an issue." Hutsell decided to go into the children's furniture arena because of the animation and excitement kids have for things. "I've always loved products where high levels of creativity is enjoyed," he said. "I love doing it for people who respond with 'that is the coolest thing in the world.' Kids do that, and more importantly, parents and grandparents do that." Hutsell calls his Rock A Buddies "grandparent bait," that the baby boomers and existing grandparents are going to love. "This is a terrific market," he said. "We're not really trying to sell to children. We like to sell to parents and grandparents things that keepsakes, heirlooms." When Hutsell was dreaming up his marketing plan the rocking chair idea kept coming back to him. "I noticed that my kids, who are now teen-agers still have the rocking chairs they had when they were little kids," he said. "People tend to keep those around. It's something that people value for a long time and treasure." Levels of Discovery Keeps Rockin' With iParenting Media Award Win! Deerfield, IL (May 2004) - Levels of Discovery began its third year in business this May as the proud recipient of an iParenting Media Award for its ever-popular "Princess" Royal Rocker. iParenting Media's mission is to recognize and present awards to the best products in the children's media and juvenile products industry. According to iParenting Media, the awards program educates consumers not only as to which children's products live up to manufacturers' claims, but those that are truly exceptional products. The Royal Rocker was one of Levels of Discovery's original introductions when the company made its debut in 2002 and remains one of the most popular items in the Rock A Buddies� product line because of its popular "Princess" theme, and all of the little "extras" that are inherent in each Levels of Discovery product. The Royal Rocker comes complete with a "crown" backrest, a removable heart-shaped back cushion and the special message, "Always a Princess." The seat of the rocker is a regal padded seat with gold tassels and hides one of this rockers' "little extras"-a green pea which is the true test for all princesses! The rocker includes a special understamp beneath the seat that the consumer can personalize with the child's name, the name of the gift-giver and the special occasion when the chair was received. A special photo greeting card is also included so the child can say "thank you" in a memorable way! The rocker is recommended for children ages 3-10 and up to 100 lbs. 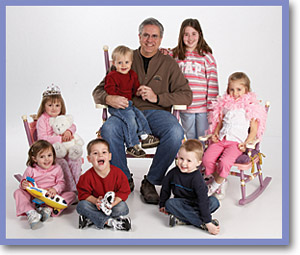 "As a full-time dad and father of a "princess," I loved creating the Royal Rocker for all of the little princesses out there," said Levels of Discovery founder Jeff Hutsell. "My goal is to bring creativity, fun and joy to the world of children's products. At Levels of Discovery I want to delight, to amuse, and to surprise our customers with unique product of the highest quality at an excellent value. I know how important kids are and created this Royal Rocker like it was for my own daughter. In addition to the Royal Rocker, Levels of Discovery offers 17 other Rock-a-Buddies� rocking chairs ($100-$150 SRP price range), 5 Rock-A-Buddies Jr. rocking chairs ($60-$75 SRP price range), 6 One Small Step stools ($40-$70 SRP price range), 4 Kiddie Ups Rocking Horses ($150-$175 SRP price range), 5 table and chair sets, 6 toy boxes, 5 clothestands, 1 storage unit, and one Vanity table set. Each piece has been safety tested for all ages. About Levels of Discovery Winner of the 2003 Juvenile Products Manufacturer Association (JPMA) Innovation Award for its Schoolhouse Rocker, Levels of Discovery's keepsake, heirloom quality furniture offers a custom made feeling without a custom made price. The company motto is that "every child deserves a little something extra," and Levels of Discovery does just that. From the hidden pea on the Princess Royal Rocker to the photo greeting card, this award-winning Rocker is a perfect example of what Levels of Discovery has to offer. Deerfield, IL (May 2003) � Levels of Discovery�s Schoolhouse Rocker has won the Juvenile Products Manufacturers Association (JPMA) 2003 Innovation Award (formerly the "Show Off" Product Competition) at the 35th Annual International JPMA show. Highlighting the year�s most original new children�s products from more than 100 competing companies, the Innovation Awards have become the industry standard for excellence. With its combination of educational value and playfulness, the Schoolhouse Rocker excels in each of these categories. Designed to encourage kindness and friendship while making learning fun, its bright, attractive primary-color finish, chalkboard seatback motif, apple finials and colorful, movable abascus beads make counting and learning colors fun and easy. Special features include a flip-up desk for reading and writing, a pencil box hidden in the armrest, and a secret music box that plays the �ABC Song�. "It�s inspiring to get this level of recognition from our peers, and exciting to see the positive reaction from buyers and retailers," says Jeff Hutsell, full-time dad and founder of Levels of Discovery, LLC, Each Levels of Discovery product is designed with "a little something extra." According to Hutsell: "We create furniture that offers far more than meets the eye, with special hidden features that make them extraordinary rather than ordinary." Levels of Discovery�s furniture is exquisitely designed to delight, amuse and surprise children by providing them with a wide variety of hidden secrets to explore and share. The Schoolhouse Rocker is part of a larger line of high-quality, handcrafted wooden children�s rocking chairs called Rock A Buddies�. Combining fun themes with hidden �discoveries� in a creative and innovative way, the wide assortment of themes are perfect for encouraging a child�s specific interest. Each chair includes a photo greeting card and bears an understamp that can be personalized with the names of the child and gift-giver as well as the date or occasion the chair was received. Other pieces in the Rock A Buddies� line include the Time Out Chair, offering children a place to think and reflect as they rock away the time, the Royal Rockers & Furniture, the Ballerina Rocker, Soccer Rocker, Hockey Rocker, Home Run Rocker, Rock & Tackle, My Best Friend Rocker, The Fire Engine Rocker and The Railroad Rocker. Intended for boys or girls up to 10 years old, Rock A Buddies have been safety tested for all ages. Rock A Buddies, Jr. is a sub-brand of smaller chairs and rockers designed just for toddlers. Levels of Discovery has recently introduced One Small Step, a collection of eleven imaginative step stools, cleverly designed to instill good habits and behavior through continuous positive reinforcement. The Little Angel furniture line, is a lively and colorful collection of cloud and rainbow-themed juvenile furniture items that feature a table, chairs, rocker, high chair, toy box bench and clothestand. Considering all the wonderful extras and the high level of craftsmanship, consumers will be surprised to discover how affordable Levels of Discovery�s furniture is. With suggested retail prices starting at $40 for One Small Step�, $50 for Little Angel, $60 for Rock A Buddies, Jr. and $100 for Rock A Buddies� (The Schoolhouse Rocker has a MSRP of $125), this high-concept furniture is priced well beneath its perceived value � the best �Discovery� of all. Deerfield, IL (Jan 2006) -- Levels of Discovery will be donating the ever-popular "Princess", "Firemen" and "Police" rockers to Queen for a Day chapters across the country. The beautiful rockers are the special seating at these parties for girls and boys to have their pictures taken - in full "royal" and "hero" attire. "At Levels of Discovery, we're all about kids and our mission is to bring creativity, fun and joy to children through our unique and FUNctional furniture pieces," says Jeff Hutsell, CEO and owner of Levels of Discovery. "We believe that every child deserves a little something extra, and Queen for a Day is a perfect fit. We are thrilled to partner with an organization that shares our desire to bring happiness to children and we are looking forward to an exciting year!"